5/16 Cup of Coffee: Just like the big league club, three of four Red Sox affiliates scored in double figures to earn a win Sunday. Sam Travis (pictured) stayed hot by homering twice in Pawtucket's victory, and Danny Mars and Mitchell Gunsolus had huge days for Salem and Greenville, respectively. It was still a great day for Andrew Benintendi despite going 0 for 4, as he found out that he was promoted to Double-A Portland after the game. The PawSox slugged their way past the Braves behind first baseman Sam Travis, who belted a pair of home runs and knocked in five. His first long ball was a three-run shot that came in the first inning and gave Pawtucket an early 3-0 cushion, while his second, a two-run blast, extended the lead to five in the fifth. He also walked twice and has now homered three times in two days after not homering since April 14. Marco Hernandez, who is a popular candidate to be called up to Boston after the Red Sox sent Sean O'Sullivan back down, set the table for Travis all day by going 3 for 4 and scoring three times. Justin Maxwell went 2 for 4 with a double, a walk, and three runs driven in. Bryce Brentz added a two-run single in the fourth as well. Henry Owens was roughed up for the first time in Triple-A this season. He surrendered seven earned runs in five innings on eight hits. He walked just two, but three of the eight hits he allowed were long balls. The bullpen stopped the bleeding however, as Roman Mendez tossed two scoreless innings with three strikeouts. Robby Scott pitched the eighth inning and did not allow a run on two punch outs before Pat Light closed it out with three strikeouts in the ninth inning. The offense for Portland will get a jolt soon with the promotion of Andrew Benintendi, but on Sunday they were only able to muster one run on six hits. Rainel Rosario had the lone multi-hit game, going 2 for 4. Nate Freiman and Henry Ramos each added a double, and Freiman had the lone RBI for Portland with a sacrifice fly. Ty Buttrey really struggled, taking the loss and moving his record to 0-6 on the year. He lasted just an inning and gave up four earned runs on seven hits and two walks. His ERA is up to 5.86 on the season. Rob Wort provided four solid innings of relief, allowing only two hits and one run, but Williams Jerez ran into trouble in the sixth, surrendering three runs (two earned) on four hits. Luis Ysla finished off the final three innings to the tune of zero runs on four hits. Things got rocky for Salem after jumping out to an early 7-0 lead, but they were able to hang on to a 10-9 victory. Salem scored three in the first on an RBI single by Danny Mars and a two-run double off the bat of Mike Meyers. The Red Sox then took advantage of the opposing starter's control issues in the second, scoring on a bases loaded hit-by-pitch from Andrew Benintendi and a bases loaded walk from Nick Longhi. Mars capped the second inning off with a two-run double, and would later add an RBI triple as part of his 3-for-5 day. Meyers finished 2 for 4 with two doubles and a walk, and Yoan Moncada reached three times with a single and a pair of walks to go along with his 25th stolen base. Dedgar Jimenez earned the win by tossing five innings. He allowed one earned run in the first four innings, but allowed four unearned runs in the fifth, as an error by shortstop Mauricio Dubon opened up the floodgates. Mario Alcantara pitched three terrific innings of relief, not allowing a run and surrendering just one hit. Jake Drehoff escaped trouble in the ninth after allowing four runs (three earned) to seal the win for Salem. The Drive made a late push to steal a win from Augusta in a wild one. Greenville fell behind 8-1 in the fifth before exploding for six runs in the sixth inning. Mitchell Gunsolus provided the big blow, smashing a one-out grand slam to pull the Drive within a run. Joseph Monge also had a big day, putting Greenville ahead twice. His seventh-inning sacrifice fly gave the Drive a 9-8 lead, and his clutch ninth-inning two-run blast put Greenville ahead for good, 11-10. He finished 3 for 5 and has his average up to .340. In addition to his slam, Gunsolus added three singles to finish 4 for 6, raising his average to .342 with Greenville. Luis Alexander Basabe, Chad De La Guerra, Roldani Baldwin, and Jeremy Rivera also chipped in with two hits apiece. It was a rough day all around on the mound for Greenville. Starter Marc Brakeman allowed five runs (four earned) in just four innings. He did strike out four and walk just one. Kuehl McEachern was touched up for six hits and three earned runs during his two innings of relief. Victor Diaz picked up the win despite allowing two earned runs on four hits in two innings. Bobby Poyner put up the lone zero for Greenville pitchers on the day, earning his seventh save and lowering his season ERA to 0.50. 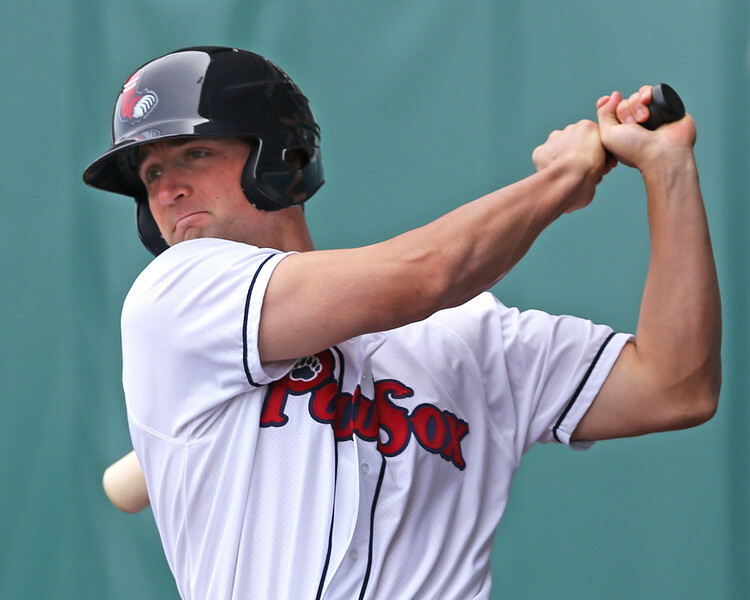 Player of the Night: A day after hitting his first home run in a month, Sam Travis belted two more homers to go along with five RBI in Pawtucket's 12-7 win. He also drew a pair of walks and is now batting .290/.349/.457 with five home runs this season for the PawSox.